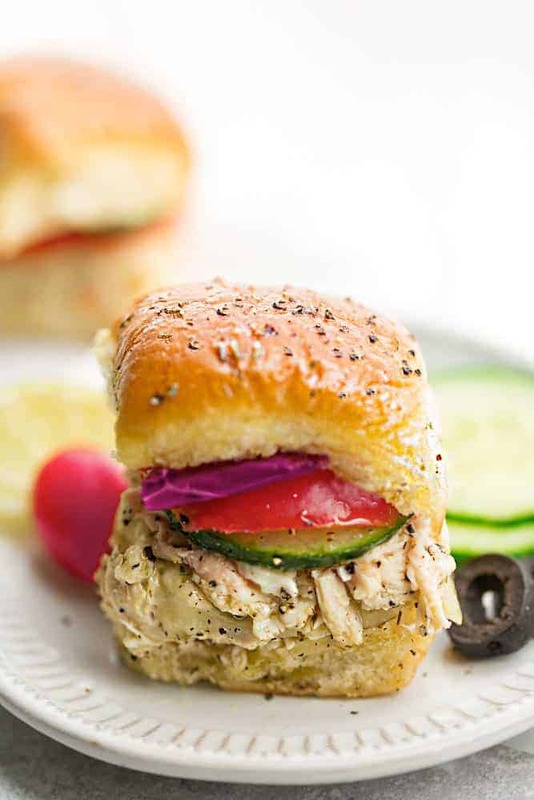 Mediterranean Chicken Sliders – perfect easy appetizers for parties, game day and barbecues. Full of Greek-inspired flavors with tender chicken, feta, gooey cheese and topped with cool and creamy Tzatziki sauce. With spring and summer entertaining seasoning heading our way, sliders are always a simple and tasty option for feeding a crowd. 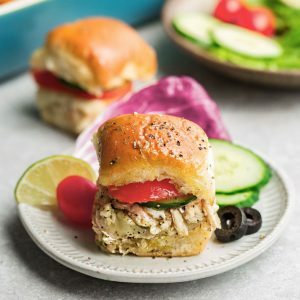 These Mediterranean Chicken Sliders come together easily and are full of of our favorite flavors we regularly miss from our trip to Greece many years ago. You can go the homemade route here or to keep things super simple, rotisserie chicken and your favorite store-bought Greek dressing work great as well. Serve with lettuce, sliced tomatoes, cucumbers, red onions and a dollop of cool and creamy tzatziki sauce for a perfect warm weather meal. This recipe makes 12 so it’s also perfect for a holiday party or family get together. Start off by combining shredded chicken with Greek dressing. Assemble the sliders by arranging the bottom halves on a lined baking sheet or lightly greased casserole dish. 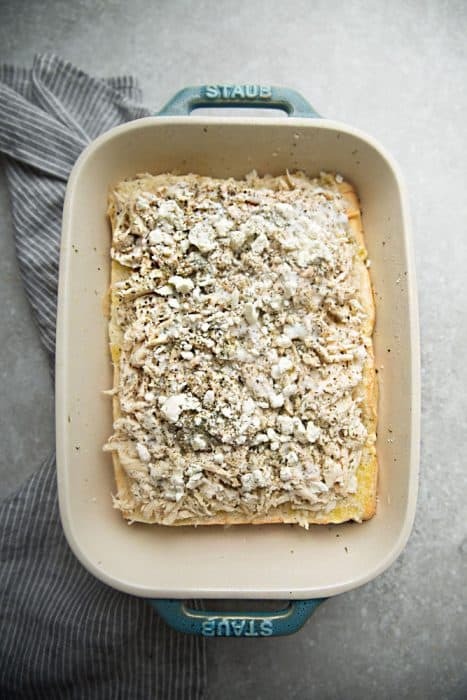 Layer with shredded chicken, crumbled feta and a layer of fresh mozzarella slices. Finish with top halves and brush with melted butter mixture along with some crumbled feta. Cover with foil and bake until cheese is nice and melty. WHAT CAN I SERVE THESE SLIDERS WITH? 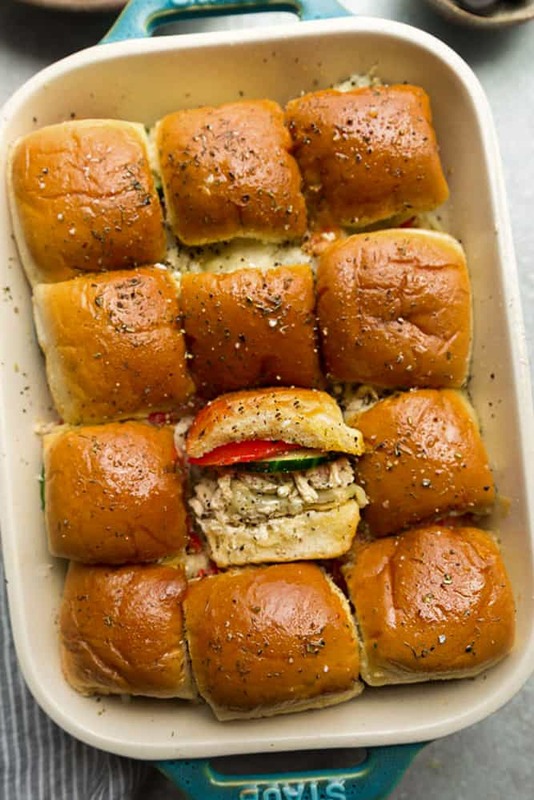 These sliders would be delicious on their own or serve with a side of Greek pasta salad, slow cooker potatoes or a side of healthy vegetables. 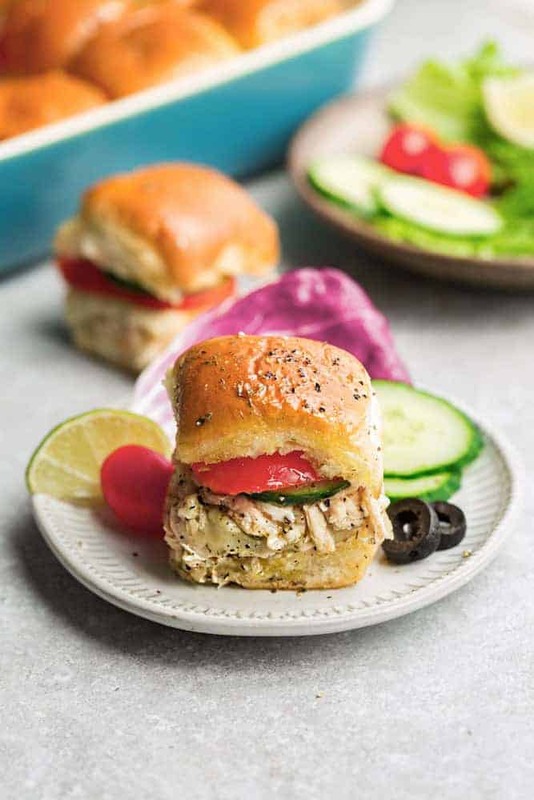 Set these flavor-packed Greek Chicken Sliders out at parties, summer long weekend cookouts, game day, holidays, or as an after-school snack and they are sure to be a complete hit! In a small bowl, combine the Greek yogurt, cucumber, dill, oregano, lemon juice, garlic and season with salt and pepper, to taste. Cover and chill in the fridge while you prepare the sliders. In a large bowl, combine shredded chicken with Greek dressing and season with salt and pepper to taste. Split your slider buns in half, place one half in the bottom of an 11x7" or 9x13" baking dish. 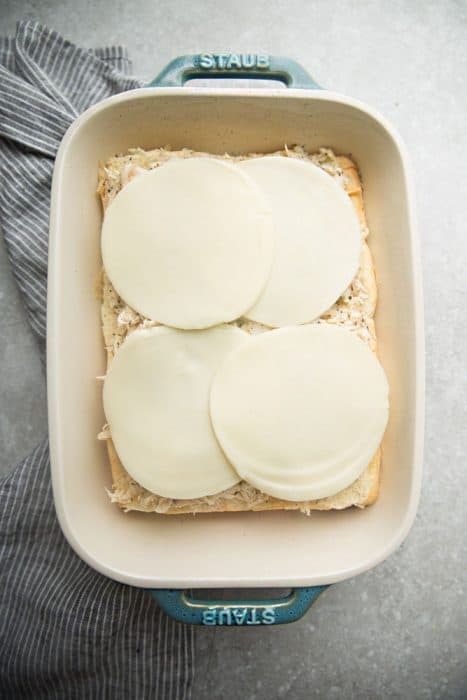 Top with shredded chicken and mozzarella slices. Place the other half of the rolls on top. Mix together the butter with oregano and basil and brush over tops of rolls. Sprinkle with feta. Cover with tinfoil and bake in preheated oven for about 5-8 minutes or until cheese is melted. Slice into individual sliders and serve immediately with a dollop of Tzatziki sauce and choice of toppings. Sliders are best warm and fresh. Wow! These looks so good. I am currently obsessed with anything greek inspired!